A lovely bisque nurse for the dollhouse. Lovely Googly Doll with Glass eyes. Mold PM 230. This is a charming boy in the garden! 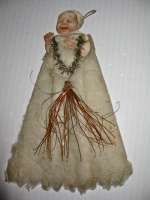 This lovely glass eyed Googly doll is from circa 1910. This bisque headed boy is marked: “ 230 PM Germany" ( Porzelan Fabrik Mengenreut) .He has big brown Googly glass sleep eyes, surrounded by finest painted lashes, sweet rosy cheeks, dimpled double chin and smiling so called "melon" mouth. He has a blond mohair wig. The old composition body has the original paint , jointed at neck, shoulders and hips. He is wearing his all original antique white two-pieces suit with a matching cap! This charming boy is ca 7" tall ( 17 cm).All original. Some wear wear to hand and foot. No repairs or restoring. Das liebe kleine Mädchen für die Puppenstube ist wunderschön modelliert mit großen eigesetzten blauen Augen. Sie hat eine blonde Perrucke. Die Puppenstube-Puppe ist aus Porzellan hergestellt. Sie ist in der originalen Kleidung und trägt einen hellen Hut auf den blonden Haaren. Sie hat schwarze gemalte Schuhen mit Riemschen. Höhe: 11,5 cm. Sehr guter originaler Zustand. ( ganz minimaler "chip" zum Oberschenkel) Deutschland um 1890. Tin Boat made by Kellermann,Germany.Pre-war. 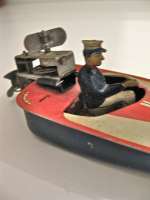 Boat with figur made by Kellermann,Nürnberg about 1930.Clockwork. Working fine.Fabrications nr.336. Good condition.Litho fine. Minimal dents at the deck. L= 6 3/4 inch- 17 cm. See Gerhard G.Walter,Nürnberger Bleechspielzeug,Laterna Magica,München,1991. Mechanical hand painted figures:Cat and Mouse made by Günthermann,Germany. Cat and mouse made by Siegfried Günthermann,Nürnberg start 1920es.An very early piece.A wind up toy: The Cat is running forward and the mouse is running around. Working fine. The condition is ok. Some of the paint is peeling.L= 10 inch- 25,5 cm. Antique Christmas ornament: A golden Dresdenshoe lined with silk. "candy container"
29" /76 cm lovely toddler doll with large eyes from the 40-ties.. 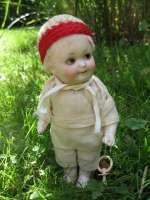 This cute doll is in mint condition, dressed in knitted boy outfit.This doll must have been carefully played with. The fine painted head is made of painted bisque and so are his arms and legs. The torso is fabric. A wonderful childhood memory!. . Antique large Christmas ornament: Scrap on spun cotton with tinsel and Dresden. 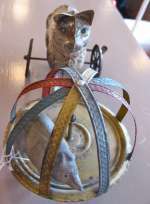 Antique Christmas ornament: Scrap on spun cotton with tinsel and Dresden. Skønt viktoriansk julepynt:pige i glansbillede på spundet vat på træ dekoreret med sølv og Dresdnerstjerner. Længde 23 cm med ophæng. Originalt. Fin stand. Ca 1880..